A widget, containing text or an image, that performs an action when pressed. A region that can display lines, rectangles, circles and other shapes. A region where users can type text. A widget that controls the visible part of another widget. A container, often invisible, that contains other widgets. The empty gray square you see when you create a Gui is a Frame. When you create a new widget, it is added to this Frame. The return value from bu is a Button object. The button that appears in the Frame is a graphical representation of this object; you can control the button by invoking methods on it. bu takes up to 32 parameters that control the appearance and function of the button. These parameters are called options. Instead of providing values for all 32 options, you can use keyword arguments, like text='Press me. ', to specify only the options you need and use the default values for the rest. When you add a widget to the Frame, it gets “shrink-wrapped;” that is, the Frame shrinks to the size of the Button. If you add more widgets, the Frame grows to accommodate them. By default, Tkinter stacks the widgets top-to-bottom and centers them. We’ll see how to override that behavior soon. If you press the button, you will see that it doesn’t do much. That’s because you haven’t “wired it up;” that is, you haven’t told it what to do! When you press this button, it should execute make_label and a new label should appear. The value of the command option is a function object, which is known as a callback because after you call bu to create the button, the flow of execution “calls back” when the user presses the button. This kind of flow is characteristic of event-driven programming. User actions, like button presses and key strokes, are called events. In event-driven programming, the flow of execution is determined by user actions rather than by the programmer. The challenge of event-driven programming is to construct a set of widgets and callbacks that work correctly (or at least generate appropriate error messages) for any sequence of user actions. Exercise 1 Write a program that creates a GUI with a single button. When the button is pressed it should create a second button. When that button is pressed, it should create a label that says, “Nice job!”. One of the most versatile widgets is the Canvas, which creates a region for drawing lines, circles and other shapes. If you did Exercise 15.4 you are already familiar with canvases. width and height are the dimensions of the canvas in pixels. The first argument is a coordinate pair that specifies the center of the circle; the second is the radius. Gui.py provides a standard Cartesian coordinate system with the origin at the center of the Canvas and the positive y axis pointing up. This is different from some other graphics systems where the origin is in the upper left corner, with the y axis pointing down. The fill option specifies that the circle should be filled in with red. width is the thickness of the outline in pixels; outline is the color. Exercise 2 Write a program that creates a Canvas and a Button. When the user presses the Button, it should draw a circle on the canvas. This way of specifying corners is called a bounding box because the two points bound the rectangle. Tkinter provides two widgets that let users type text: an Entry, which is a single line, and a Text widget, which has multiple lines. width and height are the dimensions of the widget in characters and lines. END is a special index that indicates the last character in the Text widget. You can also specify a character using a dotted index, like 1.1, which has the line number before the dot and the column number after. The following example adds the letters 'nother' after the first character of the first line. Modify your solution to Exercise 19.2 by adding an Entry widget and a second button. When the user presses the second button, it should read a color name from the Entry and use it to change the fill color of the circle. Use config to modify the existing circle; don’t create a new one. Your program should handle the case where the user tries to change the color of a circle that hasn’t been created, and the case where the color name is invalid. You can see my solution at thinkpython.com/code/circle_demo.py. So far we have been stacking widgets in a single column, but in most GUIs the layout is more complicated. For example, here is a slightly simplified version of TurtleWorld (see Chapter 4). This section presents the code that creates this GUI, broken into a series of steps. 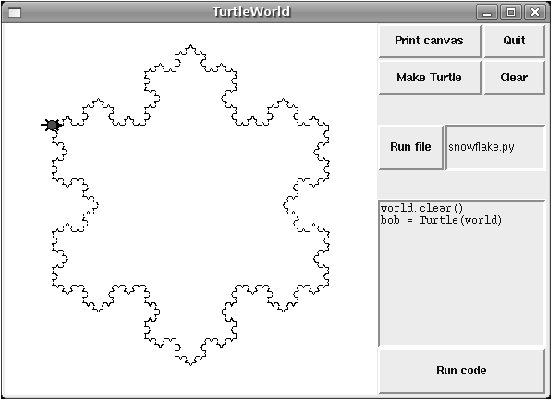 You can download the complete example from thinkpython.com/code/SimpleTurtleWorld.py. At the top level, this GUI contains two widgets—a Canvas and a Frame—arranged in a row. So the first step is to create the row. lays out the GUI is simplified for explanatory purposes.""" setup is the function that creates and arranges the widgets. Arranging widgets in a GUI is called packing. row creates a row Frame and makes it the “current Frame.” Until this Frame is closed or another Frame is created, all subsequent widgets are packed in a row. gr creates the grid; the argument is the number of columns. Widgets in the grid are laid out left-to-right, top-to-bottom. The first button uses self.canvas.dump as a callback; the second uses self.quit. These are bound methods, which means they are associated with a particular object. When they are invoked, they are invoked on the object. The first argument to row is a list of weights that determines how extra space is allocated between widgets. The list [0,1] means that all extra space is allocated to the second widget, which is the Entry. If you run this code and resize the window, you will see that the Entry grows and the Button doesn’t. The option pady “pads” this row in the y direction, adding 30 pixels of space above and below. When you use row, col or gr to create a Frame, it goes on top of the stack and becomes the current Frame. When you use endrow, endcol or endgr to close a Frame, it gets popped off the stack and the previous Frame on the stack becomes the current Frame. The method run_file reads the contents of the Entry, uses it as a filename, reads the contents and passes it to run_code. self.inter is an Interpreter object that knows how to take a string and execute it as Python code. Unfortunately, the details of widget layout are different in other languages, and in different Python modules. Tkinter alone provides three different mechanisms for arranging widgets. These mechanisms are called geometry managers. The one I demonstrated in this section is the “grid” geometry manager; the others are called “pack” and “place”. Fortunately, most of the concepts in this section apply to other GUI modules and other languages. A Menubutton is a widget that looks like a button, but when pressed it pops up a menu. After the user selects an item, the menu disappears. The first argument of mi is the Menubutton these items are associated with. The command option is a Callable object, which is something new. So far we have seen functions and bound methods used as callbacks, which works fine if you don’t have to pass any arguments to the function. Otherwise you have to construct a Callable object that contains a function, like set_color, and its arguments, like color. The Callable object stores a reference to the function and the arguments as attributes. Later, when the user clicks on a menu item, the callback calls the function and passes the stored arguments. When the user selects a menu item and set_color is called, it configures the Menubutton to display the newly-selected color. It also print the color; if you try this example, you can confirm that set_color is called when you select an item (and not called when you create the Callable object). A binding is an association between a widget, an event and a callback: when an event (like a button press) happens on a widget, the callback is invoked. Many widgets have default bindings. For example, when you press a button, the default binding changes the relief of the button to make it look depressed. When you release the button, the binding restores the appearance of the button and invokes the callback specified with the command option. The first argument is an event string; this event is triggered when the user presses the left mouse button. Other mouse events include ButtonMotion, ButtonRelease and Double-Button. The Event object contains information about the type of event and details like the coordinates of the mouse pointer. In this example the information we need is the location of the mouse click. These values are in “pixel coordinates,” which are defined by the underlying graphical system. The method canvas_coords translates them to “Canvas coordinates,” which are compatible with Canvas methods like circle. For Entry widgets, it is common to bind the <Return> event, which is triggered when the user presses the Return or Enter key. For example, the following code creates a Button and an Entry. make_text gets the contents of the Entry and displays it as a Text item in the Canvas. It is also possible to create bindings for Canvas items. The following is a class definition for Draggable, which is a child class of Item that provides bindings that implement drag-and-drop capability. The init method takes an Item as a parameter. It copies the attributes of the Item and then creates bindings for three events: a button press, button motion, and button release. cget stands for “get configuration;” it takes the name of an option as a string and returns the current value of that option. drag computes how far the object has moved relative to the starting place, updates the stored coordinates, and then moves the item. This computation is done in pixel coordinates; there is no need to convert to Canvas coordinates. This example demonstrates one of the benefits of inheritance: you can modify the capabilities of a parent class without modifying its definition. This is particularly useful if you want to change behavior defined in a module you did not write. One of the challenges of GUI programming is keeping track of which things happen while the GUI is being built and which things happen later in response to user events. If you run this code, you will see that it calls the_callback immediately, and then creates the button. When you press the button, it does nothing because the return value from the_callback is None. Usually you do not want to invoke a callback while you are setting up the GUI; it should only be invoked later in response to a user event. Another challenge of GUI programming is that you don’t have control of the flow of execution. Which parts of the program execute and their order are determined by user actions. That means that you have to design your program to work correctly for any possible sequence of events. For example, the GUI in Exercise 19.3 has two widgets: one creates a Circle item and the other changes the color of the Circle. If the user creates the circle and then changes its color, there’s no problem. But what if the user changes the color of a circle that doesn’t exist yet? Or creates more than one circle? What are the possible states? In the Circle example, we might consider two states: before and after the user creates the first circle. In each state, what events can occur? In the example, the user can press either of the buttons, or quit. For each state-event pair, what is the desired outcome? Since there are two states and two buttons, there are four state-event pairs to consider. What can cause a transition from one state to another? In this case, there is a transition when the user creates the first circle. You might also find it useful to define, and check, invariants that should hold regardless of the sequence of events. This approach to GUI programming can help you write correct code without taking the time to test every possible sequence of user events! One of the elements that makes up a GUI, including buttons, menus, text entry fields, etc. A value that controls the appearance or function of a widget. An argument that indicates the parameter name as part of the function call. A function associated with a widget that is called when the user performs an action. A method associated with a particular instance. A style of programming in which the flow of execution is determined by user actions. A user action, like a mouse click or key press, that causes a GUI to respond. An infinite loop that waits for user actions and responds. A graphical element on a Canvas widget. A rectangle that encloses a set of items, usually specified by two opposing corners. To arrange and display the elements of a GUI. A system for packing widgets. An association between a widget, an event, and an event handler. The event handler is called when the event occurs in the widget. PhotoImage can only handle a few image formats, like GIF and PPM, but we can use the Python Imaging Library (PIL) to read other files. Download image_demo.py, danger.gif and allen.png from thinkpython.com/code. Run image_demo.py. You might have to install PIL and ImageTk. They are probably in your software repository, but if not you can get them from pythonware.com/products/pil/. In image_demo.py change the name of the second PhotoImage from photo2 to photo and run the program again. You should see the second PhotoImage but not the first. The problem is that when you reassign photo it overwrites the reference to the first PhotoImage, which then disappears. The same thing happens if you assign a PhotoImage to a local variable; it disappears when the function ends. To avoid this problem, you have to store a reference to each PhotoImage you want to keep. You can use a global variable, or store PhotoImages in a data structure or as an attribute of an object. This behavior can be frustrating, which is why I am warning you (and why the example image says “Danger!”). Starting with this example, write a program that takes the name of a directory and loops through all the files, displaying any files that PIL recognizes as images. You can use a try statement to catch the files PIL doesn’t recognize. When the user clicks on the image, the program should display the next one. PIL provides a variety of methods for manipulating images. You can read about them at pythonware.com/library/pil/handbook. As a challenge, choose a few of these methods and provide a GUI for applying them to images. You can download a simple solution from thinkpython.com/code/ImageBrowser.py. A vector graphics editor is a program that allows users to draw and edit shapes on the screen and generate output files in vector graphics formats like Postscript and SVG1. Write a simple vector graphics editor using Tkinter. At a minimum, it should allow users to draw lines, circles and rectangles, and it should use Canvas.dump to generate a Postscript description of the contents of the Canvas. As a challenge, you could allow users to select and resize items on the Canvas. Use Tkinter to write a basic web browser. It should have a Text widget where the user can enter a URL and a Canvas to display the contents of the page. You can use the urllib module to download files (see Exercise 14.5) and the HTMLParser module to parse the HTML tags (see docs.python.org/lib/module-HTMLParser.html). At a minimum your browser should handle plain text and hyperlinks. As a challenge you could handle background colors, text formatting tags and images.